Oops . . . I forgot to add one more Heidi film to my list last week. 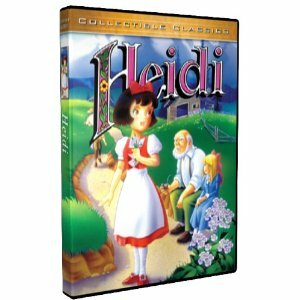 Heidi, the 1996 animated version by Jetlag Productions, is only 47 minutes long and is especially entertaining for younger tykes. The film is certainly not Disney quality animation , but it's sweet and has some songs kids will love. It's a fine rendition of the classic story of the little Swiss girl and her grandfather living in the Alps. Thanks! I'm now following you back! That would probably be the best for my kids... for some reason, they only like shows with animated characters.